Saint Louis FC announced another addition to the 2018 roster Monday with the signing of defender Jonathon Barden. The defender spent last season in Canada with Otttawa Fury FC. Fans of the local United Soccer League club may remember some of his work from last season. Barden is the latest signing by the club this offseason. The club will begin its fourth season in the United Soccer League (USL), the second tier of professional soccer in the United States, in March. STLFC will enter the 2018 USL campaign under first-year head coach Anthony Pulis, who takes over for the departed Preki. 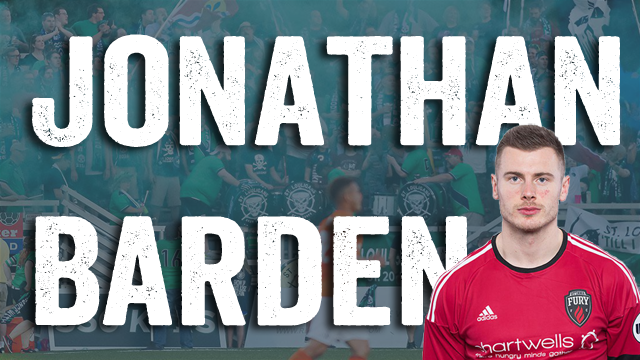 Jonathan Barden has been signed by Saint Louis FC of the United Soccer League. Jonathan Barden appeared in 27 matches for Ottawa last season, recording a lone goal. That goal, of course came against Saint Louis FC. Officially listed as a midfielder/defender, he showed off his offensive skills in the 38th minute on September 3 in Ottawa. Barden beat STLFC’s Ryan Howe along the sideline before dribbling into the penalty area. He made a quick move to avoid a sliding Ivan Mirkovic before beating Devala Gorrick on the short side.
.@jbarden100 has signed with @SaintLouisFC. Barden grew up in Harrow, England and spent his youth years playing in West London for the Wealdstone FC youth system. His soccer career brought him stateside in 2011 to play collegiately at James Madison University in Harrisonburg, Virginia. He made 65 starts over four years for the Dukes program. While in college Barden played for the Ottawa Fury, then of the Premier Development League. After college, his first professional contract was with Íþróttabandalag Vestmannaeyja in Iceland’s top league, the Pepsi-deild karla or Icelandic Men’s Premier League. IBV, as it is more commonly known, plays in Vestmannaeyjar, Iceland. The town is off the southern coast of Iceland, in case you aren’t familiar with the country and think it is covered in ice. The town is comprised of a group of islands off the coast, six of which are only home to a single hunting cabin each. After two years of playing in Iceland, Barden returned to North America to rejoin the team in Ottawa, now known as Ottawa Fury FC and playing in the United Soccer League. Despite playing soccer away from England since 2011, Barden still maintains his accent, as you can tell from his interview last year discussing his goal against Saint Louis. Barden is excited to play for coach Pulis and in front of the St. Louis fans. Excited to announce my signing for @saintlouisfc! Can’t wait to get going with the 2018 season and to play in front of some of the best fans in the league! Sam Fink will be featured on the latest episode of the This Is Silly! podcast with the St. Louiligans. The characters, some would call them stooges, behind the podcast and Twitter account announced on the social media platform today that they would be recording the episode with Fink on Wednesday evening. Former Saint Louis FC defender Konrad Plewa will be taking his talents to Herriman, Utah as he has signed a deal with Real Monarchs SLC. Plewa made 20 appearances for Preki last season in St. Louis. Plewa came to St. Louis last offseason after winning the USL Cup with New York Red Bulls II the previous season. The Polish defender is a little over a year removed from suffering a stroke after returning from a NYRBII road trip in 2016.